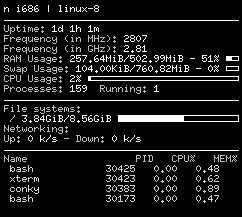 Many Linux users want to have an application monitoring the system usage on their desktop. Conky is a solution that is suitable for lightweight Linux installations on old computers. Latest version of Conky was released last week, but most probably the older version available from the package repositories of your favourite distribution will work just fine. In the official home page for Conky, you find nice screenshots of the application with respective configuration files. They are certainly worth having a look if you want to have a lightweight system monitor on your desktop.